Philip M. Lustbader & David Lustbader, a Professional Corporation (the Lustbader Law Firm) enjoys an excellent reputation in the legal community throughout the Livingston area, Essex County, Morris County and New Jersey for assisting injured accident victims and workers injured on the job with their personal injury and workers compensation claims. We have provided aggressive representation since 1973. Our law firm received the highest rating — an AV rating* — from our peers as reported by Martindale-Hubbell. 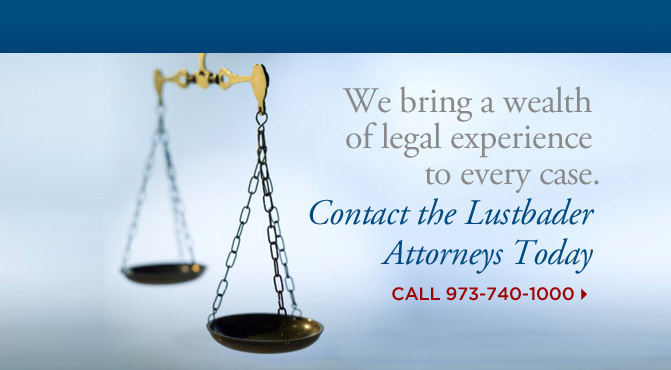 David Lustbader is certified by the Supreme Court of New Jersey as a civil trial attorney. Only a very small percentage of New Jersey trial lawyers have this certification. Please visit our Benefits of Retaining Our Law Firm page for our qualifications. We have extensive experience representing plaintiffs and defendants in personal injury and wrongful death claims, including assisting injured workers with workers compensation claims (sometimes referred to as workmans or workmens compensation). For additional information about the different matters we handle, please visit our Client Testimonials page. If you have been hurt on the job or injured in an accident because of someone else’s negligence, you should consult an experienced personal injury lawyer for advice. 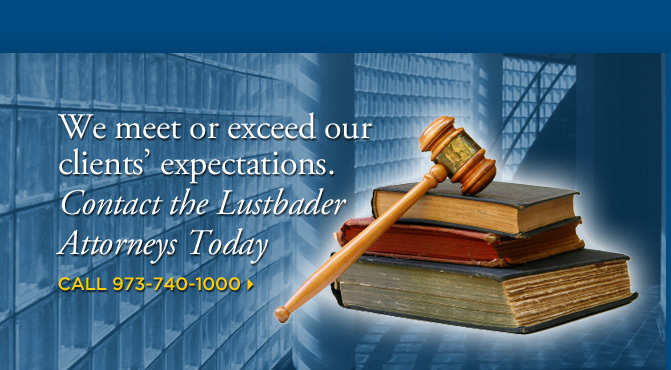 Livingston Attorney David Lustbader can provide you with accurate information and advice based on experience. 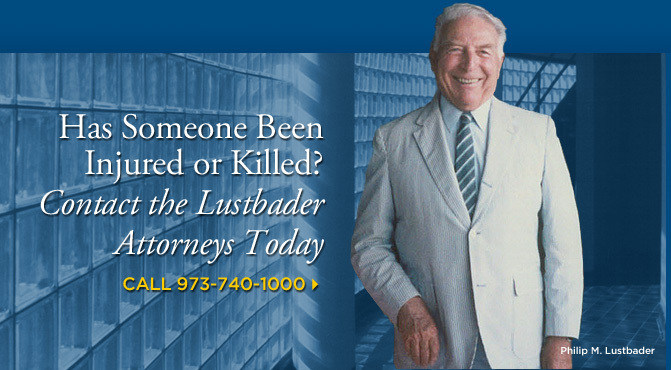 To schedule a free consultation with attorney David Lustbader, please call us at (973) 740-1000 or, if you prefer, fill out our intake form and we will contact you to schedule a complimentary consultation. Please use this intake form or click to send an e-mail--your choice. 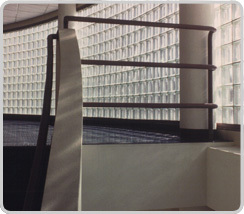 Located in Livingston, NJ, Philip M. Lustbader & David Lustbader, a Professional Corporation represents individuals and families injured in accidents throughout New Jersey, including Livingston, Hackensack, Paterson, Jersey City, Newark, Elizabeth, New Brunswick, Freehold, Toms River, Somerville, Morristown, Newton, Belvidere, Flemington, Trenton, South Orange, East Orange, West Orange, Orange, Irvington, Springfield, Union, Westfield, Millburn, Short Hills, Chatham, Summit, New Providence, Berkeley Heights, Mountainside, Madison, Convent Station, Florham Park, New Vernon, Morristown, Mendham, Whippany, East Hanover, Hanover, Parsippany, Morris Plains, Rockaway, Denville, Mountain Lakes, Dover, Randolph, Succasunna, Basking Ridge, Bernardsville, Bedminster, Montclair, Glen Ridge, Bloomfield, Caldwell, North Caldwell, Cedar Grove, Upper Montclair, Little Falls, Pine Brook, Montville, Lincoln Park, Boonton, Nutley, Belleville, Garwood and Cranford. We handle cases involving motor vehicle accidents and car crashes on all thoroughfares throughout New Jersey, including I-287, I-78, I-280, I-95, Route 24, Route 124, Route 28, Route 10, U.S. 9, U.S. 1, U.S. 22, Eisenhower Parkway, Garden State Parkway, New Jersey Turnpike (NJ Turnpike) and the JFK Expressway.